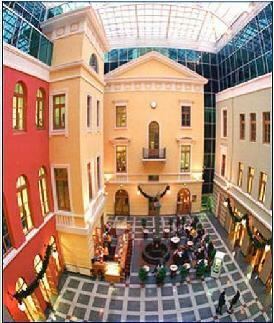 Completed in 1997, Nevsky 25 is one of the first true Class A office buildings developed in St. Petersburg. The project comprises 8,000 m2 (80,000 s.f.) of retail and office space and offers computerized building management systems, PBX telephone connections and an Atrium Cafe. Tenants include Stockmann, Deutsche Bank, EBRD, Ford, Regus and consulates of the U.S. Japan and Norway. Glenn Williamson served as General Director of the Nevsky 25 company and project manager for GE Golub-Europe, the developer. Williamson coordinated financing, construction, leasing and property management. Russia's financial crisis in 1998 froze bank deposits, devalued the rouble 400% and led to bankruptcy for all retail tenants by October of that year. Neverthelss, determined releasing and creative workouts led to opening a new Stockmann Department store less than 2 months later in time for Christmas.